As environmentalism and conserving resources becomes more of a concern for people, families everywhere are looking to go green in unique and interesting ways. This extends to constructing their homes out of new, innovative materials, like ICF systems. But how do ICF homes help the environment? How does this material create unique environmental benefits? ICF, or insulated construction forms, can help to reduce waste during the actual construction of homes. When constructing ICF walls, only one row of the wall is constructed at a time. End blocks are then cut to fit; this helps to reduce waste by limiting the amount of material that goes unused. Construction waste can contribute significantly to overall waste in landfills across the country, and limiting construction waste through insulated concrete forms can help keep your new home construction eco-friendly. ICF construction takes less time than many other conventional construction methods. Because ICF is constructed in a “building blocks” method, construction can move more quickly. This ultimately results in reduced energy during the construction process, as the process itself is completed in less time than other traditional methods. Where most methods of construction last longer and require more energy to complete a build, ICF buildings are completed in less time with fewer drains on electricity and energy. Not only does ICF construction help during the building process; ICF homes also improve energy efficiency for occupants later on. This type of construction tends to have higher insulation values, helping you keep your heating and cooling costs low. 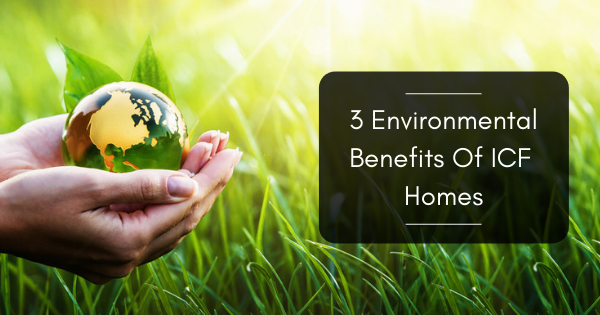 Your heating and cooling systems in your home won’t have to work as hard to keep temperatures comfortable, meaning reduced energy expenditure and an overall greener home. A wide variety of options exist to build your home with greener materials and construction practices. While insulated concrete forms might not be the first option that comes to mind, this particular construction material can help you create a home with fewer environmental consequences both during construction as well as once you’ve moved in. There are no CFC or HCFC released during the Nexcem manufacturing process. Most blowing agents that are used in the polystyrene manufacturing and processing operation contain CFC or HCFC, both of which contribute to the destruction of the Ozone layer. Nexcem is comprised of simple ingredients, cement and wood aggregate. Nothing in the Nexcem process is remotely hazardous or detrimental to the environment. Reduced Carbon Footprint. Even though Nexcem is made with energy intensive cement, the carbon that is sequestered in the recycled waste wood almost offsets the carbon used in cement manufacturing. Insulated concrete form homes can have many benefits, even outside of the environmental factors. For more information on insulated concrete building blocks and other green building materials, contact Nexcem today.